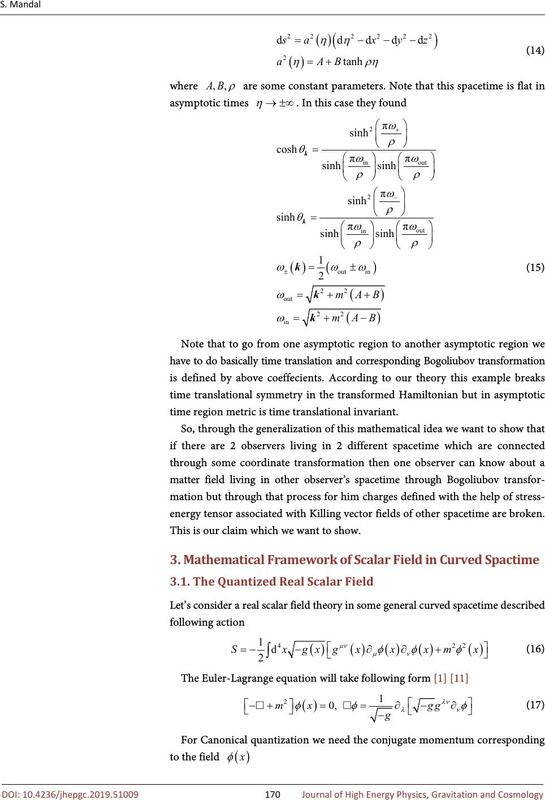 tensor   of matter fields in curved spacetime is covariantly conserved . and ones after transformation have their own separate domain to act on states. 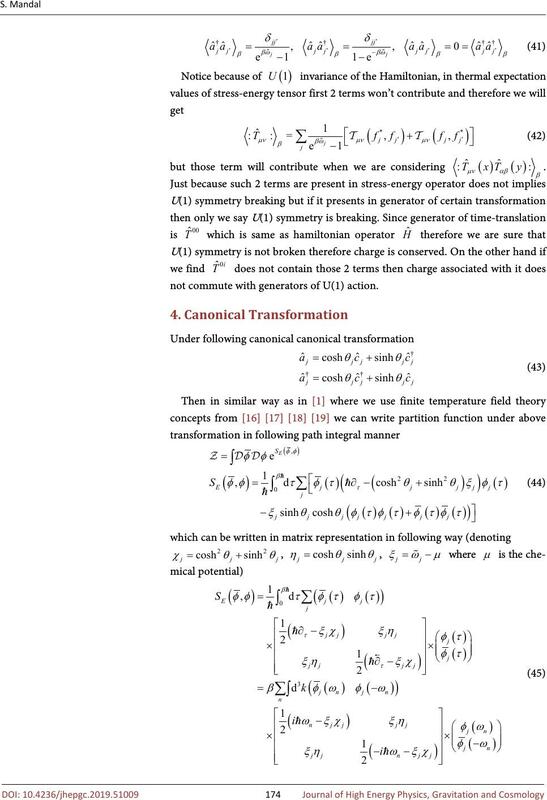 Killing vector fields in Minkowski spacetime. 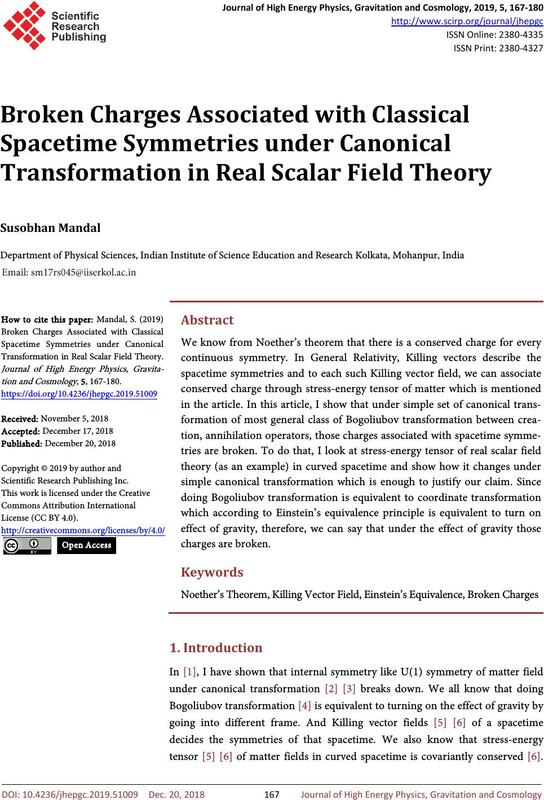 translational symmetry breaks but the spatial translation symmetry is maintained. 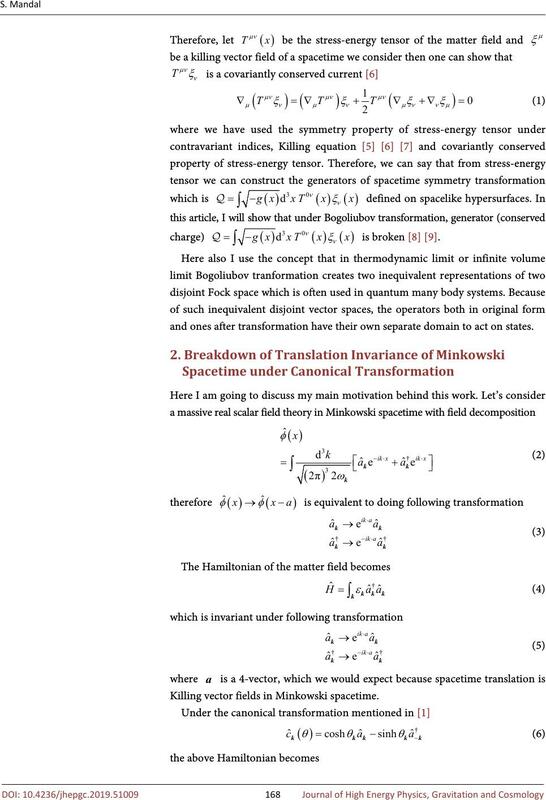 translation symmetry of Minkowski spacetime breaks down. 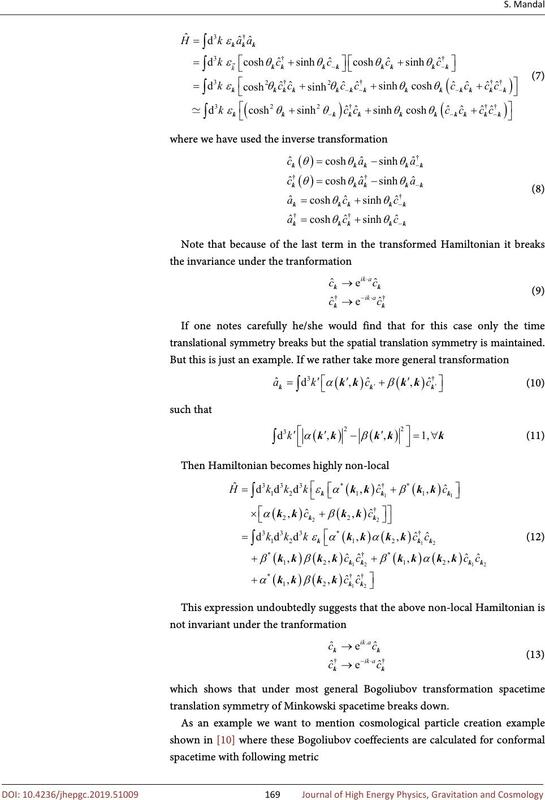 time region metric is time translational invariant. 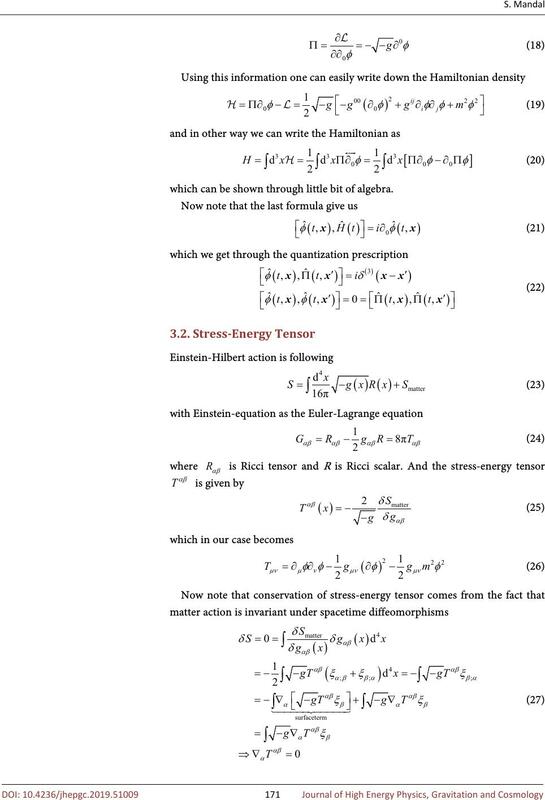 energy tensor associated with Killing vector fields of other spacetime are broken. This is our claim which we want to show. which can be shown through little bit of algebra. is a Killing vector field of the spacetime. being a set of labels which distinguish independent solutions. not commute with generators of U(1) action. 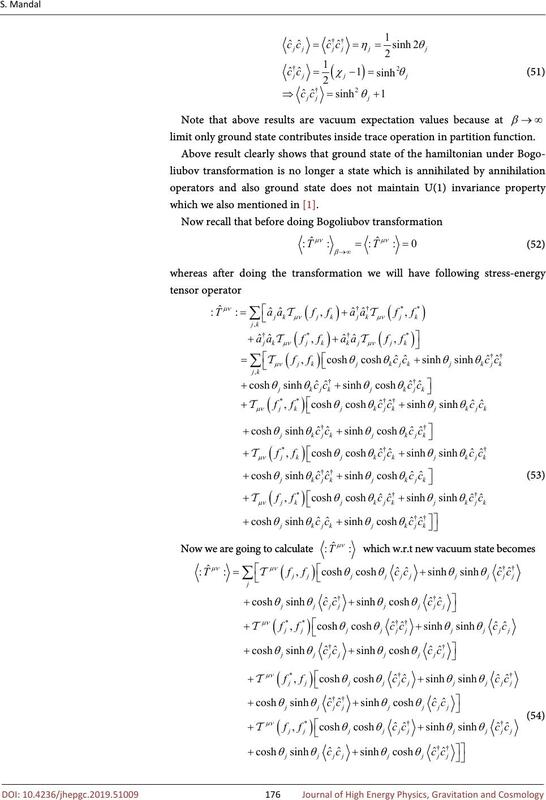 limit only ground state contributes inside trace operation in partition function. which we also mentioned in . vector fields which defined the corresponding symmetries of the spacetime. rimental observation that would point towards its correctness. CSIR to support this work through JRF fellowship. Modern Methods of Plant Analysis. Springer-Verlag, Berlin. Functions in de Sitter Space. matical Exposition. Springer-Verlag, New York. General Theory of Relativity. Wiley, Hoboken. Goldstone, J., Salam, A. and Weinberg, S. (1962) Broken Symmetries. 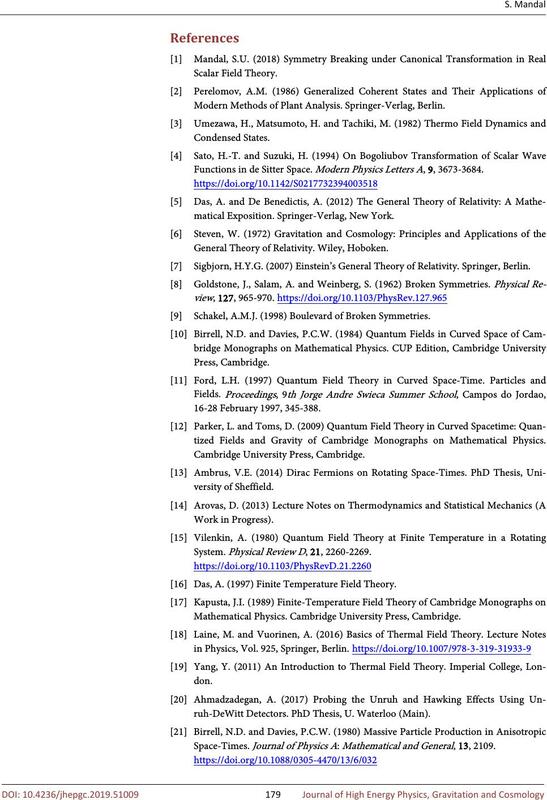 tized Fields and Gravity of Cambridge Monographs on Mathematical Physics. 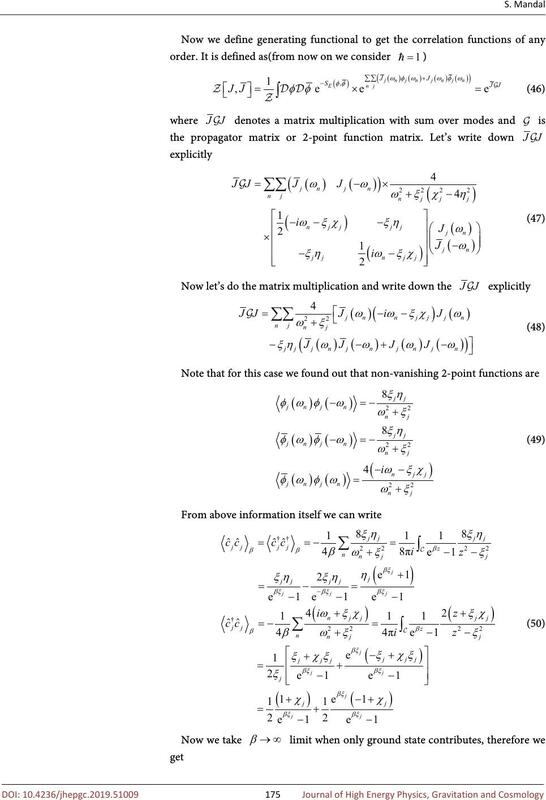 Mathematical Physics. Cambridge University Press, Cambridge. in Physics, Vol. 925, Springer, Berlin. ruh-DeWitt Detectors. 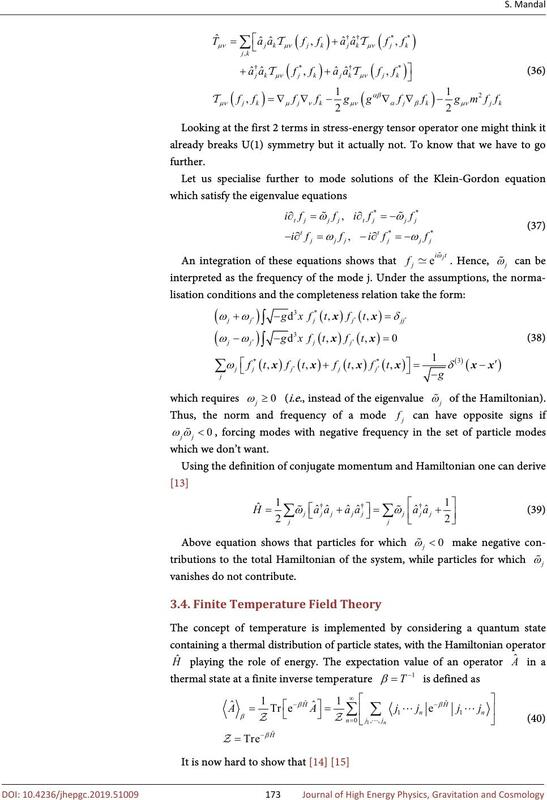 PhD Thesis, U. Waterloo (Main). Biswas, S., Guha, J. and Sarkar, N.G. 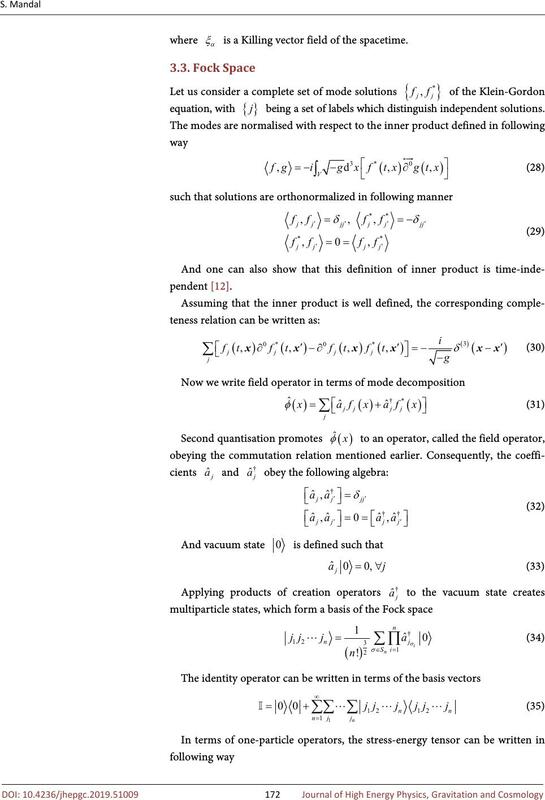 (1995) Particle Production in de Sitter Space. Davies, P.C.W. (1975) Scalar Production in Schwarzschild and Rindler Metrics. Frieman, J.A. 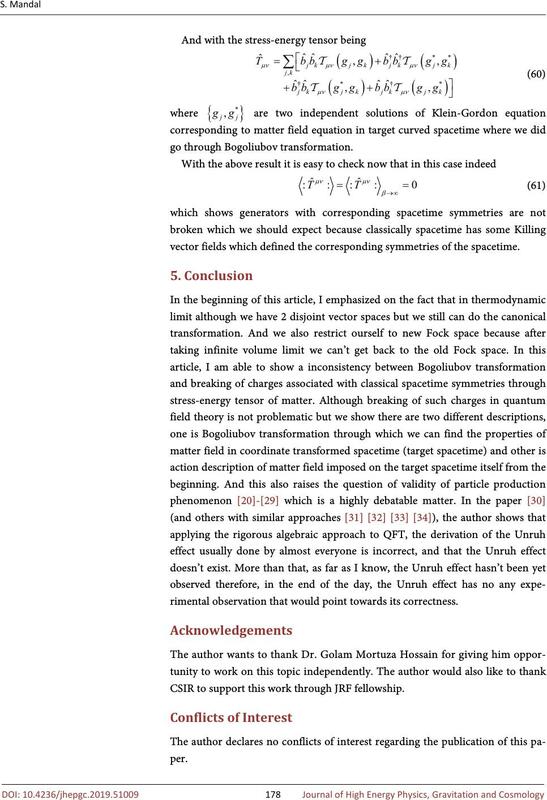 (1989) Particle Creation in Inhomogeneous Spacetimes. , 72, Article ID: 104011. Buchholz, D. and Verch, R. (2015) Macroscopic Aspects of the Unruh Effect. Unruh Effect in Field Mixing. Ford, G.W. and O’Connell, R.F. 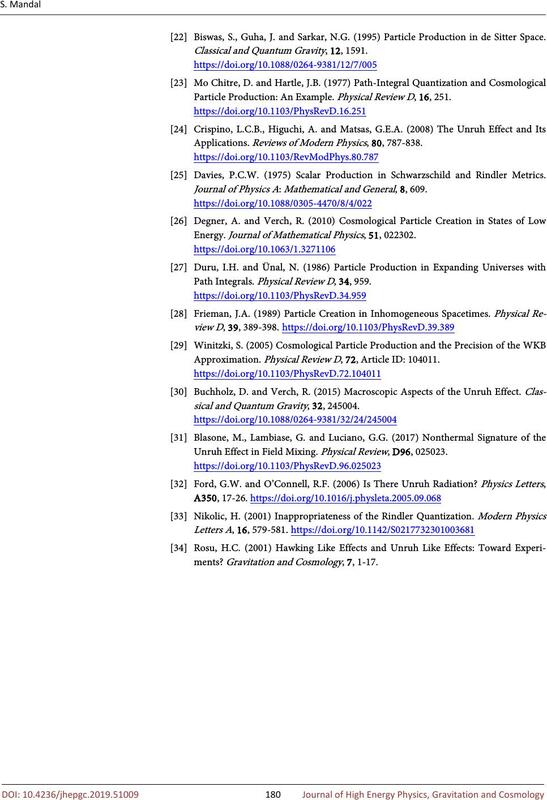 (2006) Is There Unruh Radiation? 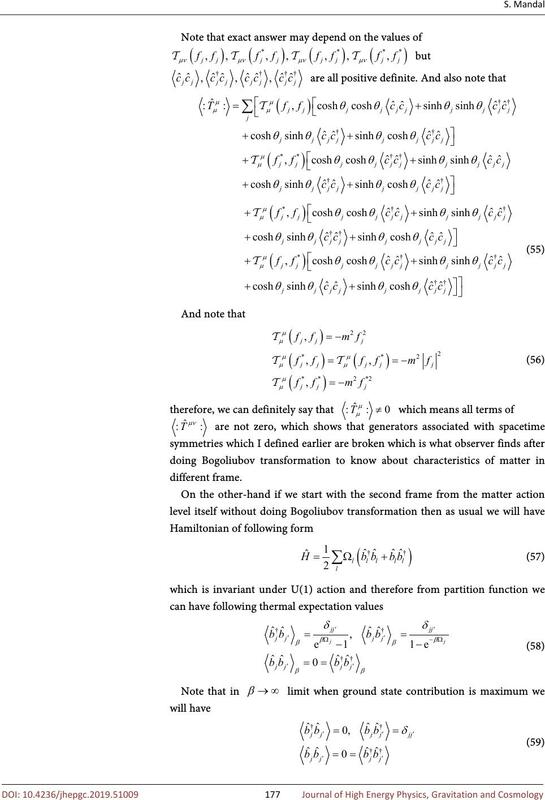 Nikolic, H. (2001) Inappropriateness of the Rindler Quantization.